Many of the early settlers in this area came from South Carolina. Marion became a county almost one year before Florida became a state and was named after South Carolinian General Francis Marion. General Marion was nicknamed “The Swamp Fox” because he engaged in “gorilla” type warfare during the Revolutionary War and he was known for his heroic leadership during the War. Actor Mel Gibson portrayed a character loosely based on Francis Marion in the 2000 movie, “The Patriot”. Marion County was created from portions of Hillsboro (now Hillsborough) County on the south, Alachua County on the north and central, and Orange (or Mosquito as it was known at the time) on the east. The Act creating the County of Marion in the Territory of Florida was signed on March 14, 1844, by the territorial governor, R. K. Call. The area which Ft. King sat had previously been a part of Alachua County. The county seat of Alachua County was Newmansville which was about fifty miles from Ft. King. The roads in those days were not very good, and travel time was extensive, so political influences began the process to establish a new county. Fort King became the first Court House. Shortly after Marion County was formed the first known Sheriff, William Strifel, was appointed. Sheriff Strifel only served for the remainder of that year (1844). In 1849, Putnam County was created and took the northeast portion of Marion County. Levy County’s creation took some of the western portion of Marion County in 1877. The Marion County Sheriff’s Office came into being as a result of the State Charter in 1845. The first Sheriff under statehood was Edmund Davis Howse, who was sworn in on October 31, 1845. Sheriff Howse served until 1851. 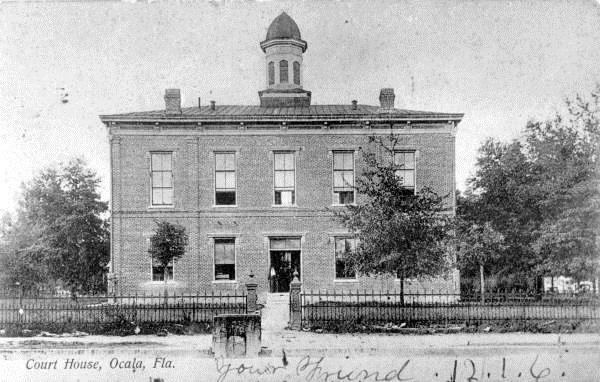 In 1846, Ocala was chosen for the county seat. A small log building was erected near what is now the town square to serve as a temporary courthouse. Ft. King had been deactivated and the timbers from the buildings were used for other structures. The first jail was built around 1847 on the northwest corner of what is now the downtown square in Ocala. Marion County’s first real courthouse was planned in 1850, and constructed on the town square in 1851. It was described as a two story, stately looking frame building of colonial design. The first floor contained offices, with the courtroom on the second. The jail was described as a small building about fifteen feet square, with two stories. The entrance to the lower floor was through the upper floor. In 1854, a new jail was constructed away from the Square because of complaints that the jail detracted from the new courthouse on the square. With Ocala established as the county seat, new roads were required to link Ocala to the outlying settlements. Road crews consisting of three men each were appointed by the County Commissioners. The crews decided on routes for the roads, and then cut a path for each route. After a route was approved, an eight foot wide clearing was made following the trail. The road was then left to gradually make the rutted road by regular use. Simeon Halvenston was the second Sheriff of Marion County, and served from 1852 to 1855, apparently not finishing his term. (No documents survive today explaining why he did not complete his term) Norman A. McLeod was installed as Sheriff in 1856, but lasted only a short time before Simeon Halvenston was re-elected, serving the second time from 1857-1859. In 1859, Daniel Cappleman was elected the fifth Sheriff of Marion County, serving from 1860 to 1863. During the period of unrest before the Civil War, Marion County had strong ties to South Carolina. This was due to many transplants from that state having moved to the area. Such ties were demonstrated by the actions of the people in late 1860. The people of Marion County were generally in sympathy with the other states over the growing discontent between the north and the south. In November of that year, a meeting was held at the courthouse to discuss the situation. The result was that a written appeal was drafted and sent to the governor of Florida, urging him to assemble a state convention to consider seceding from the Union. Florida did secede on January 10, 1861. Floridians, and particularly Marion County residents, became important leaders and soldiers in the Confederate armies. L. D. Harris took office of Sheriff in 1864, but served only a short time. The reason for the short term has apparently been lost to history, but those were unsettling times. Whether Harris left to join the war or left office for some other reason is unknown. Samuel O. Howse became the next Sheriff, serving from 1864 to 1865. His relationship to Edmund Davis Howse, if any, has not been determined. Samuel Howse owned a cotton gin on a creek which flowed to what is now the southern part of Tuscawilla Park in Ocala. Benjamin F. Priest, a Marion County native who had served as a captain in the Civil War, was elected Sheriff after the war, serving until 1868. After the war, the people of Marion County were suffering from personal sacrifice and financial ruin. One of the richest counties in the state before the war, Marion now saw many people in financial distress. The reconstruction regime made all county officials except constables, appointees of the Governor. In 1868, Marion County had its first African-American Sheriff when M. A. Clouts was appointed Sheriff, serving from 1868 to 1870. Crime was prevalent in Florida during the years following the Civil War. Marion County was not as bad as north and west Florida, but still had its share of trouble. One example was the murder of Neil Ferguson, the county tax collector. On December 2, 1871, Ferguson was robbed and murdered on a lonely road near Flemington. The culprits were caught, tried, convicted, and hanged in the rear of the jail yard. In 1871, John O. Matthews took office, serving until 1873. William G. McGrath became the eleventh Sheriff of Marion County, and served between 1873 and 1877. For unknown reasons another Sheriff came into office in 1877, Francis D. Carver, but no further records can be found. During this time, the county was still feeling the financial pinch of the war. Things were so bad that lawsuits forced the sale of public property. On September 6, 1875, the courthouse and county jail, and the property on which they stood, were auctioned off. They were sold to the highest bidder, for $101.00. A well-known Ocala attorney, John F. Dunn, bought the property as a public spirited citizen. Dunn held the property until conditions improved and he deeded it back to the county. Also during the financially troubled times, the county commissioners’ pay was reduced to $25 per year, and most expenses except those required by law were discontinued. By 1876, Florida and Marion County were recovering. The Federal Occupation troops were withdrawn, and the state legislature was almost back to normal. Orange groves were becoming a major source of income. Tourists, many of them well-known business and political leaders, began to discover Silver Springs and spread the word of its great beauty. Around 1880 the cigar industry came to Marion County. The work force which came with the industry was Cuban and they built their own town. Named for the apostle of Cuban independence, Jose Marti. Marti City stood between what is now Pine Street and Martin Luther King Blvd. At its prime the city had its own government and boasted as many as 13 cigar factories. But by the turn of the century the cigar factories had moved to Tampa and Marti City became mostly abandoned. Francis Pooser was elected Sheriff and served from 1877 to 1881. By that time, Florida was back to elected rather than appointed Sheriffs, and Anson B. Crutchfield was elected in 1880. Crutchfield served two terms until 1889. The town of Ocala had many beautiful buildings housing businesses around the town square. All were wood frame, but well built. On Thanksgiving Day, November 29, 1883, a fire started in one of the businesses. Before it was over, most of the downtown buildings had burned to the ground. Much of Ocala’s and Marion County’s recorded history was lost in the fire. A new courthouse was built about 1884. As with most other new buildings, it was a brick structure, two stories, with the typical tower and dome on top. 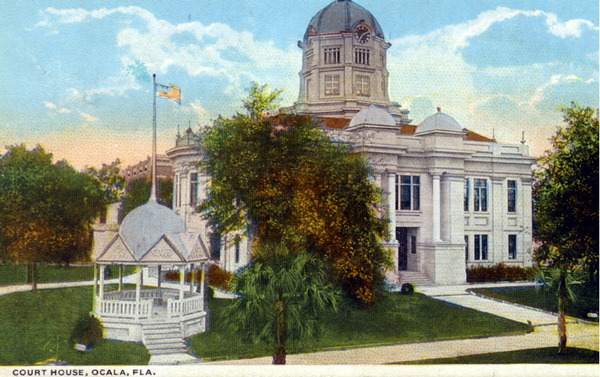 The new courthouse was built in the center of the Square in Ocala. Marion County was growing in the 1880’s. Much of the land still belonged to the United States, and homesteads were staked out over the county. Towns throughout the county, many of which are gone and forgotten today, were established during the 1880’s. During this time, Marion County was ranked as the fourth richest county in Florida. The railroad opened stations at Lowell, Martin, and Kendrick. Belleview became an incorporated town in 1885. In 1888, Ocala got electric lights, and also obtained a steam powered fire engine. Edwin T. Williams was elected Sheriff and served from 1889 to 1893. Around this time, about one-third of all citrus shipped from Florida came from Marion County. Groves and growers were flourishing. Then on December 27 and 28, 1894, a major freeze destroyed the fruit on the trees, but did not badly damage the trees. January, 1895, brought warm and sunny weather, with enough rain to make the trees begin to grow. Then on February 8, freezing cold entered central Florida without adequate warning, and with devastating results. The cold froze the sap in the trees, which was up due to the recent warm weather. The bark split, and the trees died. By winter’s end, citrus groves in Marion County were wiped out. Most of the trees were cut up for firewood. Benjamin D. Hodge was elected Sheriff and served from 1893 to 1897. By the spring of 1895, Marion County was again on the verge of bankruptcy. Both banks in the county had failed. But the people of the county again overcame this adversity, and Marion County slowly came back. Hodge B. Dupree followed Sheriff Hodge, and served from 1897 to 1898. Apparently something caused Sheriff Dupree to leave office after about two years, because Perry H. Nugent took over in 1898 and completed the term. Nugent then ran for re-election and won, serving until 1905. It is interesting to note that, in many cases in the 1800’s, those elected Sheriff did not complete their terms. In most cases before 1900, the reasons are unknown and are lost to antiquity. Even though we have been unable to find reasons for the incomplete terms, we found nothing to imply that any of these men were killed in the line of duty, although that may be possible in some cases. Times were quite often hard during the years of 1845 to 1900, and the life of a Sheriff was either a part-time, honorary position or most likely a hand-to-mouth existence. We do know, from census rolls, that several of the very early Sheriffs were successful farmers or had successful businesses. After 1900, Sheriffs occasionally did not complete their terms, but we usually have records, and newspaper articles to know what happened in those cases. Before 1900 we can only speculate as to reasons for Sheriffs leaving office early. Prior to 1901, Florida had leased convicted prisoners to work for private individuals for firms. In 1901, the state prohibited using leased convicts to work in phosphate mines, but continued to allow other uses. During this time, it was common practice to lease convicts to private businesses or individuals for work. Many businesses of the time found this to be cheap labor, or used convicts for menial tasks which needed little or no training. From the documents shown, the normal charge was apparently $28.65 per prisoner for 30 days. The Florida Naval Stores and Commission Company was a large user of rented convicts. The company built a convict farm east of Ocala to house leased convicts. The site later became the Florida Industrial School for Girls, and is now the Marion County Governmental Complex located on SE 25th Avenue in Ocala.